Please welcome Georgia Center for Nonprofits Executive Vice President, Programs & Senior Consultant Kathy Keeley on Wednesday, March 20 at the Mountain City Club. Keeley is traveling from Atlanta to share best practices for reaching different generations with innovative development efforts. From her experience with many kinds of organizations across the country and in dozens of countries, Keeley will offer members nationally and internationally recognized expertise to benefit their organizations locally. Please register to attend and learn the kind of insights that have earned her the attention of 60 Minutes, The Oprah Winfrey Show, ABC Evening News, BBC News, and Voice of America Radio. Congratulations to our McClarty Scholarship recipients! Scholarship recipients are new to professional fundraising (2 years or less) and will receive mentoring opportunities and a complimentary year-long membership to the the AFP Chattanooga Chapter. Please say hello to our new members at upcoming meetings! AFP TN, Southeastern Chapter will host Metro Ideas Project Executive Director Joda Thongnopnua about the results of the recently released Community Indicators Project. Commissioned by the Community Foundation of Greater Chattanooga, the study identifies community trends development professionals can use to help effect the biggest issues facing the Chattanooga community and better inform fundraising strategies. 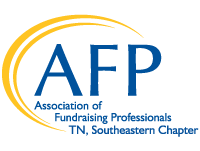 If you are new to the fundraising profession, please consider applying for the AFP TN, Southeastern Chapter’s McClarty Scholarship. The Jack McClarty Scholarship(s) are awarded each year based upon a competitive application process. Jack McClarty was a founding member of the chapter and development director at Southern Adventist University. Scholarship applicants must be employed full-time and be individuals newly employed in the field of fund raising (less than 2 years). Scholarships may be renewable subject to decision of the Executive Committee of the AFP Tennessee, Southeastern Chapter. Introductory scholarships may be awarded for no more than two (2) years. Applications are due to Jennifer Nicely at jennifer_nicely@memorial.org. DEADLINE: Extended to February 11, 2019. We excited to honor the following persons at the upcoming National Philanthropy Day event on Tuesday, November 13th at the Chattanooga Convention Center. We hope that you have made plans to join us. Join us at our upcoming mixer! We will be hosting a mixer at STIR on October 10th for fellow non-profit friends in the area. AFP members and non-members are encouraged to attend this free event which will highlight the diversity of our profession. We are excited to bring in author and speaker Jonathan Fanning as our speaker at our October 17th meeting. You have two opportunities to hear Jonathan, one during our normal lunch session (11:30-1:00) and one during an additional morning session from 9:30-11:00 am. The morning session is only $10! Come for one session or both! Click on the link below for more information and registration information. Apply to win the Chamberlain Scholarship! Would you like to attend the 56th AFP International Conference on Philanthropy to be held March 31 – April 2, 2019 in San Antonio, TX?? Apply now to win the annual Chamberlain Scholarship which covers your registration fee as well as $500 towards your travel expenses. Applications are due by October 1, 2018. Attend Bolder Board Training with us. We are happy to sponsor an upcoming event being hosted by Venture Forward featuring well-know author and speaker Dan Pallotta on September 12th here in Chattanooga. We will not hold a regular monthly meeting in September due to this training. Next meeting is October 17th! Mark your calendars for our last remaining regular monthly meeting in 2018. We hope you will make plans to join us. All regular meetings are held from 11:30am-1:00 pm at the Mountain City Club. Watch for more detailed program information to come soon.